Send a bright and beautiful message of your care and concern. This graceful yellow and white arrangement of roses, lilies, cremones, alstroemeria, daisy poms and solidago is hand-arranged in a cube vase to express your peaceful gesture of sympathy. 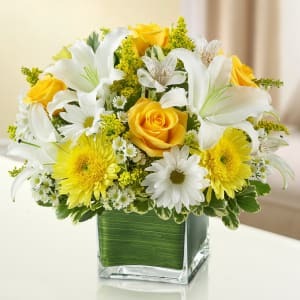 • Elegant yellow and white arrangement of roses, lilies, cremones, alstroemeria, daisy poms and solidago, accented with variegated pittosporum and myrtle.